Brendan Wolfe, who both blogs at the Biederbecke Affair and works as the editor of the VFH’s Encyclopedia Virginia [Encyclopedia Virginia Blog], responded to my last post with an incredibly thought-provoking question. Per your instructions, I clicked when I was finished crying, and now I want to make a comment about your post regarding Lee’s decision to resign from the Army and accept a commission from Virginia. I sympathize with your efforts to bring more balance to the historical consideration of this moment; I even sympathize with your tendency to chide men like Al Stone for their myth-steeped take on the Civil War. newspaper article you link to — calling him a traitor? The myth of Lee may be bad history but it’s also played an important role in putting the country back together again. I know there are all sorts of caveats and potential objections to that last statement, so I’m curious to know what you think. Let’s assume for the sake of argument that by the turn of the twentieth century Americans did indeed have a cultural/political need to exonerate or at least not judge Lee “too harshly.” We don’t have to explain why beyond acknowledging the broad goals of reconciliation and reunion that have been so ably sketched by David Blight. The interesting question for me is whether that could have been carried out without necessarily abandoning the complex set of factors that entered into Lee’s decision, which no doubt included questions of honor and loyalty to his state of Virginia. As historians have made very clear over the past few decades, Lee was also a slaveholder who had a great deal in common with other white southerners who worried about their ability to maintain their human property within the Union. What I am suggesting is that while I understand the need to use Lee as a point of reconciliation and reunion I have to ask whether or not the way in which it was done involved too great a price. After all, the traditional explanation of Lee’s decision rarely places him within a broader context of how others in his position responded to Fort Sumter and Lincoln’s call for 75,000 men to put down the rebellion. And it rarely explains how concerns over race and slavery entered into his decision. During the postwar era as the image of a slave-less Lee engaged in a simple question of honor ascended into the realm of mythology our memory of slavery as a cause and emancipation as a consequence of the war gradually waned. The reinforcement of the former and the disappearance of the latter helped lay the foundation for the politics of Jim Crow. Clearly, the traditional story of Lee’s decision did not benefit the overwhelming majority of black Americans. In fact, the inability of African Americans to challenge or even amend our national memory of a slave-less Lee helped solidify the narrative and reinforce our nationalistic tendencies. There is a reason as to why Lee is depicted in the WWII poster with a white serviceman. We can’t even imagine a poster that depicts Lee along with a black soldier even though a significant number served in WWII? Perhaps it’s a stretch but can’t one assume that the slave-less Lee helped to extend the idea of racially segregated military through 1948 and the need on the part of A. Philip Randolph to threaten a march on Washington, D.C. if President Roosevelt did not address discriminatory practices among defense contractors? I come back to the question of whether it was possible to deal with Lee in a way that might bring about a certain amount of cultural and political healing without losing sight of the important role that race and slavery played in this crucial moment in our nation’s history. Again, did the price of it all have to be emancipation and the bravery of 180,000 former slaves and free blacks? I don’t know the answer to that question, but I appreciate your raising the initial question and I welcome other readers to respond. Although I personally don’t find surprising the choice of a white serviceman in the Lee WW2 poster (black Confederates even then having been hidden away from public view for so long as part of a vast conspiracy against truth), here’s my question: why do some people still need to see a Lee detached (indeed, isolated) from his world as part of an understanding of him now? Isn’t this a distortion of the historical record? To ask this question is to begin to answer it. I think that people associate with Lee the same thing that is associated with say the Cubs. People “love” the underdog. The ones who have to fight against the long odds and there is something noble about that good fight. Why people associate Lee with this is beyond me. Yes, he was the underdog, but by no means overmatched in many cases. I think the current neo-confederate surge is because historical trends today are going in the opposite direction of the neo-confederate ideology…the ideology that for the last 150 years has put the confederate int the light of the poor, overmatch underdog fighting for a noble cause. In turn Lee (Jackson et al.) had been raised to sainthood in that process. This confederate surge is now fighting against historical works like Mr. Simpson’s who show the war in a more correct light…in other words placing slavery back in the historical context of the war and calling into question the admiration of people like Lee. I suppose it was _possible_ for us to have “dealt with Lee” in such a manner, but it implies a level of self-consciousness that, of course, doesn’t exist. The myth of the Lost Cause, suggested by Bruce Catton as containing within it a seed of reconciliation, was hardly intended to grow such fruit. (Ouch. Dumb metaphor.) And I’m not sure it’s even possible to make such retrospective judgments, i.e. how much myth would have been good for Reconstruction versus how much history we needed to avoid Jim Crow. We are where we are, as General Petraeus might put it. We have the myth we have, for better and for worse. I’m just curious to know more about that better and that worse, and your idea of a relationship between the mythical Lee and a kind of willful blindness among segregationists to that particular injustice — well, that’s a great start. And anyway, jumping off Brooks Simpson’s comment, we should be careful not to conflate & confuse the various time periods during which this myth has found a use. We must detach Lee from his context so that we can better use him for our own contemporary purposes. So what are those today? Brendan, — I could have made the following point yesterday, but I wanted to keep my response focused and fairly straight-forward. While we tend to interpret reconciliation and reunion as a direct result of the myth of the Lost Cause it is important to acknowledge a vibrant “emancipationist” memory of the war that continued into the twentieth-century. So, as to your first point it is important to note that the level of “self-consciousness” which you suggest is unreasonable was in fact present. That is why I speculated yesterday as to the possibility that Americans could have engaged in a process of reconciliation through Lee, while at the same time not lose sight of emancipation. I tend to think that most people’s attachment to Lee is relatively benign and not in line with the political and racial agendas of radical segregationists. Perhaps Al Stone is an example. His portrayal is very traditional. It includes a dose of history along with the stories that we have grown so emotionally attached to. In terms of the sources he utilizes it is important to recognize that they are mostly older accounts that reinforce Lost Cause themes rather than the more recent analytical and sophisticated studies. My guess is that most white Southerners find the traditional Lee to be a comfort in the face of significant political, social, and economic change throughout the south. Keep in mind that the Lost Cause was “constructed” at just such a time. 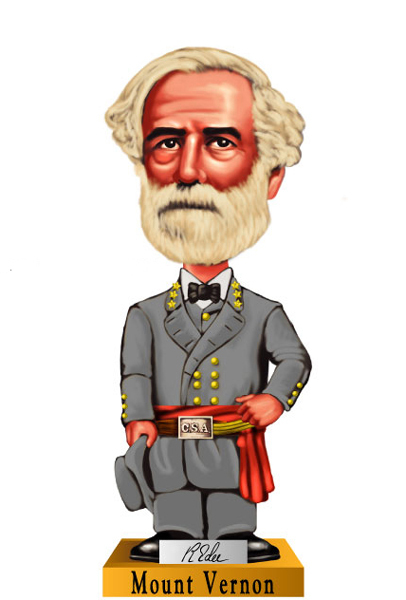 I think the interpretation of Lee as a somewhat-unwilling player in the Civil War is more than just a part of reconcilliationist history or a cultural need to cast people as honorable or heroic. Certainly, both of those are factors, but to me, this seems more like an outgrowth of a human need to tell the stories that we think explains “us.” That need is not uniquely American, it flows across time and cultures. It has less to do with history than acculturation or assimilation. We use simple stories about our past to tell what we believe to be fundamental truths about our characters. Simple stories require simple narratives. There is no room for ambiguity, because it calls the simple truth into question. To take a local, non-Civil War example: Thomas Jefferson was a great American who believed in the inherent freedom of men, which he codified in our Declaration of Independence. He was a thinker, a builder, an innovator, always pushing the limits of the possible. That is what we consider a fundamental American story. It says we are a freedom-loving people, that our belief in freedom and democracy is the bedrock upon which the country was built, and that we, too, are innovators. It when you get into the details of TJ that things get murky. You have the whole conflict between the lover-of-man being a slave-owner. Then DNA starts flying around, and it seems an awful lot like one of the fathers of our country fathered a bushel-basket of kids with one of those same slaves, and didn’t even have the good grace to emancipate her when he died. To historians not deeply attached to the perfected TJ, this is wonderful. It’s a chance to talk about miscegenation rates on antebellum plantations, the limited options opened to slave women if their owners took a fancy to them, the interpretation of DNA evidence in historical cases, and most of all, how truly complex the abolition of slavery was even for those Southern slave-owners who would have preferred to be done with it, but just couldn’t see how it could be done. To people who do still want to believe in the simple story of American greatness embodied by TJ, it’s a travesty. An attempt by revisionists to ruin an otherwise heroic story. When we choose the messy, complex Jefferson, we learn about ourselves. When we choose the simple, heroic Jefferson, we validate ourselves. Given a choice, I suspect that most people would choose validation over introspection. Which is why it’s a good thing there is an Internet. Otherwise, those of us who prefer a side of introspection with our history would end up sitting in a corner, babbling to ourselves. What you write makes sense, but when you say that the myth of Lee “seems more like an outgrowth of a human need to tell the stories that we think explain ‘us,'” I would respond by asking what’s the difference. The myth for purposes of reconciliation and the myth for purposes of explaining “us” are the same thing for the same purpose. Anyway, the “us” you mention is not some fixed thing that Lee or Jefferson help to explain. The “us” is not even an identity that all of us share or claim, although sometimes these stories are an attempt, as you say, to change that. The “us,” rather, is a need we have that is shaped by the circumstances of our time and place. I’m not sure there is anything inherent about casting people like Lee as heroic, only that it often suits our purposes to do so. Thanks everyone for your thoughtful comments on this issue. I tend to agree with you Brendan. The “us” that Heather refers to is both fragmented along various lines and constantly changing. Look deeper at a given time and we may even be confronted with what philosophers call the problem of other minds. In other words, we have little or no access to what the idea of Lee means or how it is represented in any individual’s mind. What we can assume as historians, however, is that our public representations of Lee have contributed to tangible political structures such as Jim Crow and bad history. The historical Lee has always been an ideological weapon. We remember Robert E. Lee so we can forget about Frederick Douglass. Hi Larry, — I’m not sure how to make sense of the intentionality that is implied in your comment. What would you say about any generic career US Army officer and West Point graduate who swore an oath to uphold and defend the US Constitution, suddenly renounced the oath, consciously planned and executed a war against the United States, invaded US territory with hostile forces, and failed in the attempt? There is nothing honorable about treason.